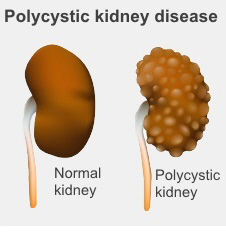 Polycystic kidney disease (PCKD) is passed down in families – you inherit it from one or both of your parents. It is the most common form of inherited kidney disease. If you have PCKD, a lot of cysts – or sacs filled with fluid – form on your kidneys. These can slowly cause your kidneys to stop working properly. It might also make cysts grow in other parts of your body, such as your liver, brain or heart. How do I know if I have PCKD? ultrasound, to look for cysts (although the cyst might be too small to show on ultrasound). If you have PCKD, your doctor might talk to you about screening your children to find out if any of them have inherited it. There is no treatment that can stop or slow down the development of PCKD. But it is important to make sure you keep your blood pressure under control, and have a healthy lifestyle. About half of people with PCKD will develop a mild form of chronic kidney disease (CKD), which doesn't develop further or only does so in old age. However, the other half develop severe CKD and will need a kidney transplant or dialysis. Detailed information about PCKD, including the different types, possible complications, and also the pros and cons of screening other family members. Detailed discussion of PCKD, including genetics, and its effects on the rest of your body.